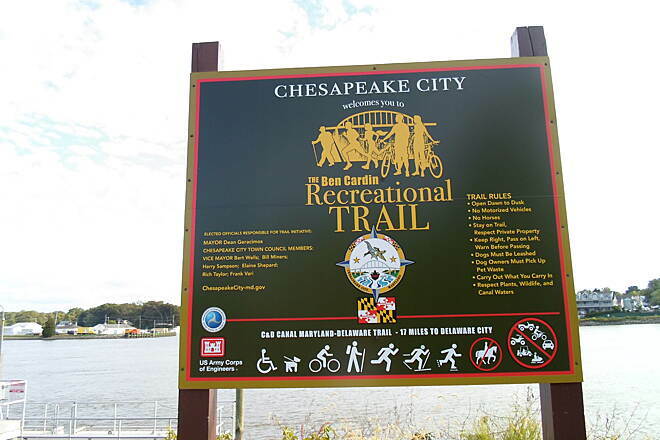 Sign along the Ben Cardin Trail. 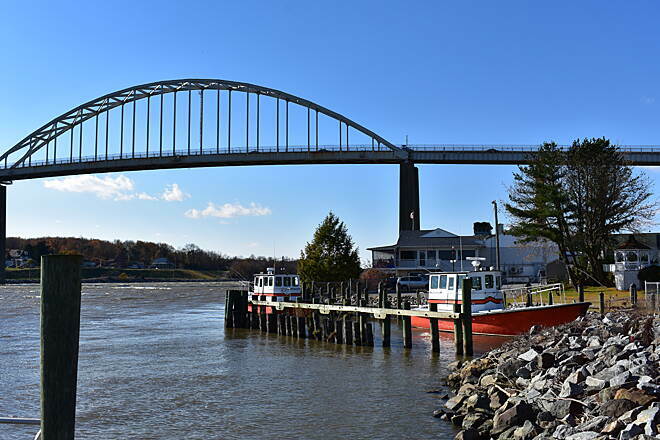 The steel bridge that carries Route 213 over the canal towers high above the western terminus of the trail in Chesapeake City. 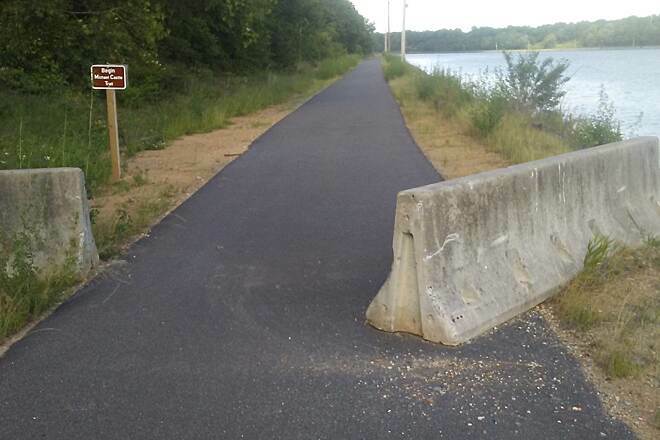 Beware the 'Jersey barrier' at the eastern terminus of trail on the Maryland/Delaware trail; it was still protruding into the greenway as of June 2017. 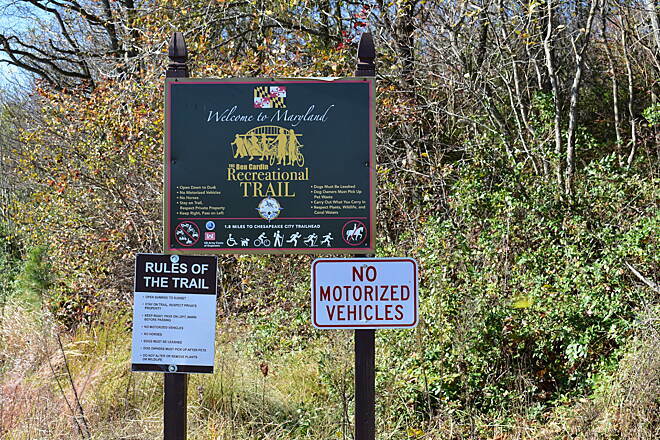 Sign marking the eastern terminus of the trail at the Maryland/Delaware state line. 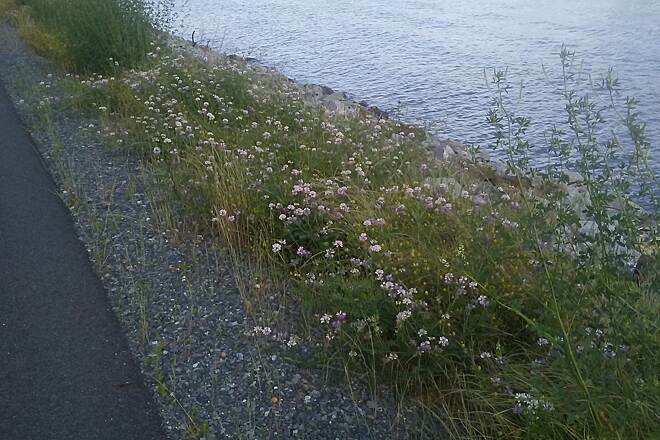 These wildflowers add color on the strip separating the canal and trail near the DE border. 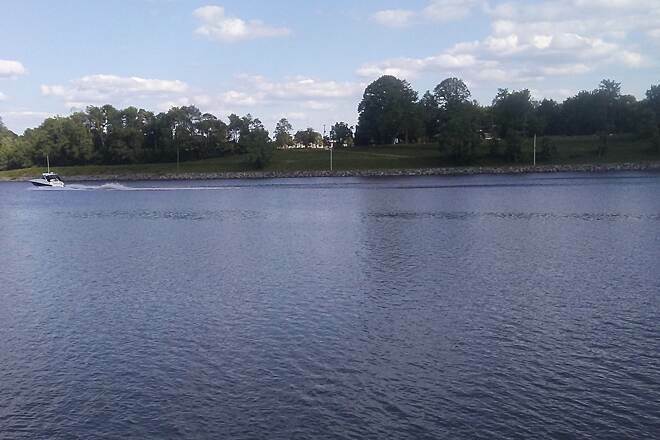 Look close, and you can see a cemetery on the canal's south bank. 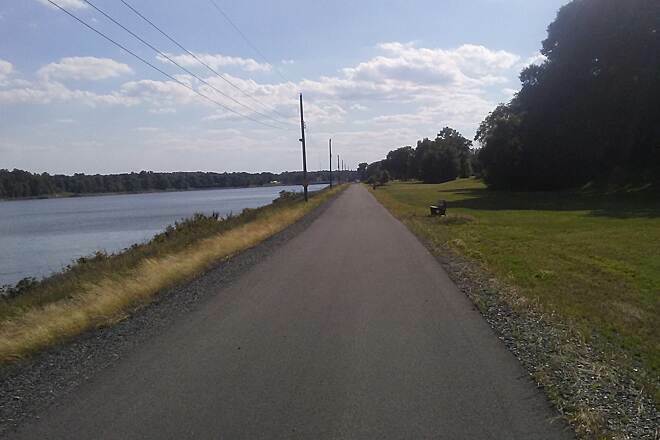 Heading east toward the DE border and the Michael Castle Trail. 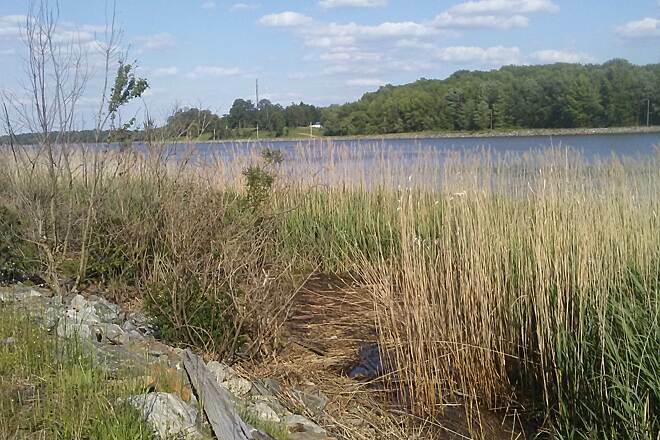 This small wetland has developed along the banks of the canal east of Chesapeake City. 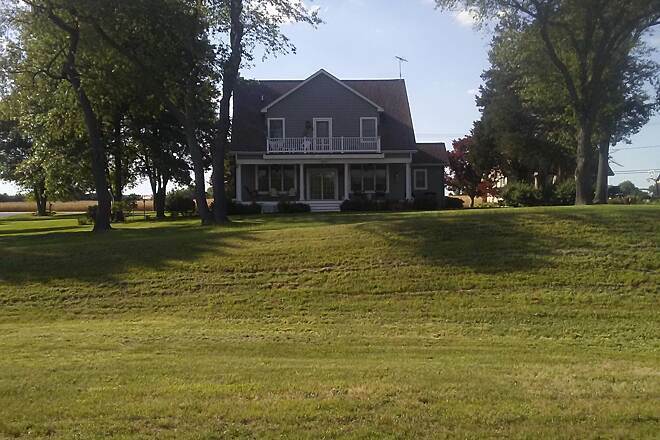 The trail passes this stately home east of Chesapeake City. 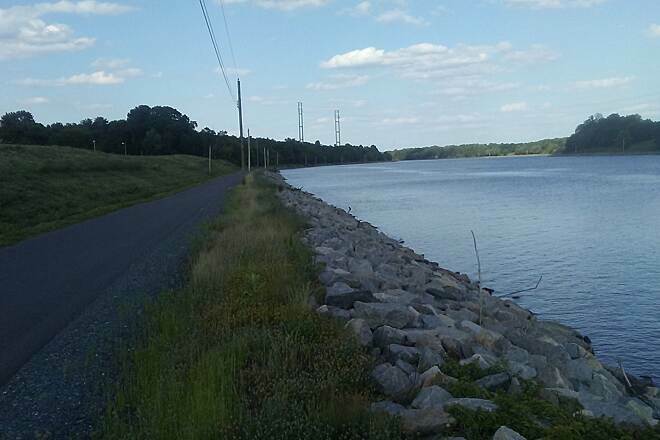 Looking west down the trail toward Chesapeake City. 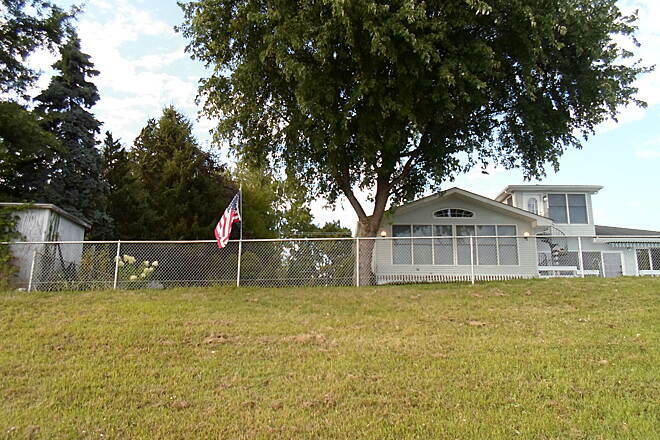 The trail passes this quaint home and big yard east of Chesapeake City. 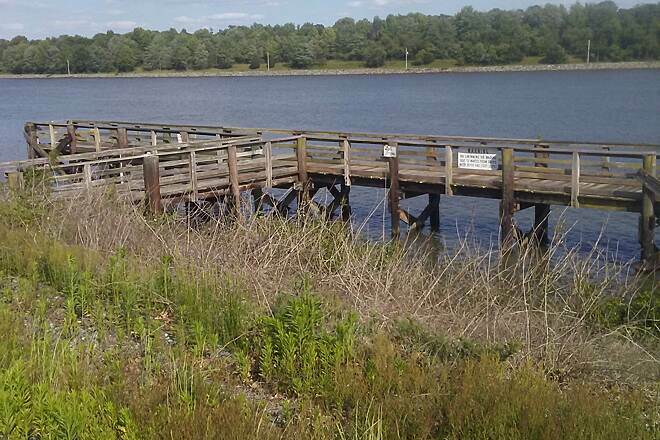 This boat dock is along the trail on the east end of Chesapeake City. 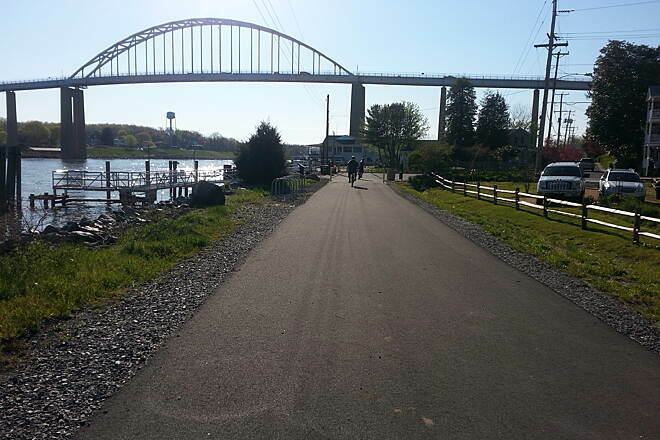 One of the few negative aspects of the trail is the lack of shade, which can make it very hot and sunny in the warmer months of the year. 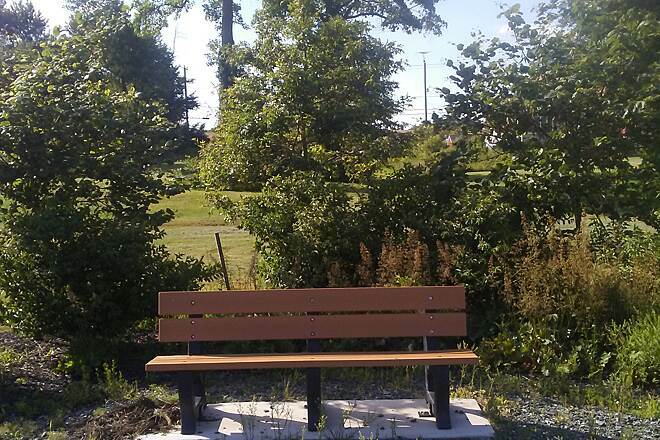 This problem should be rectified in the near future as the shrubbery grows around these benches. 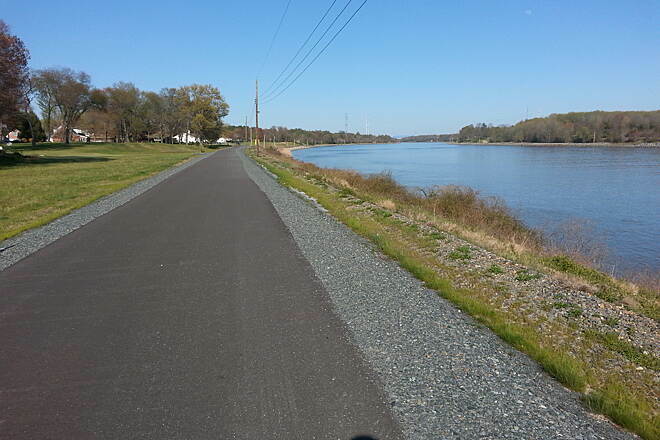 The lawns of homes adjoining the trail get larger and picturesque on the east end of Chesapeake City. 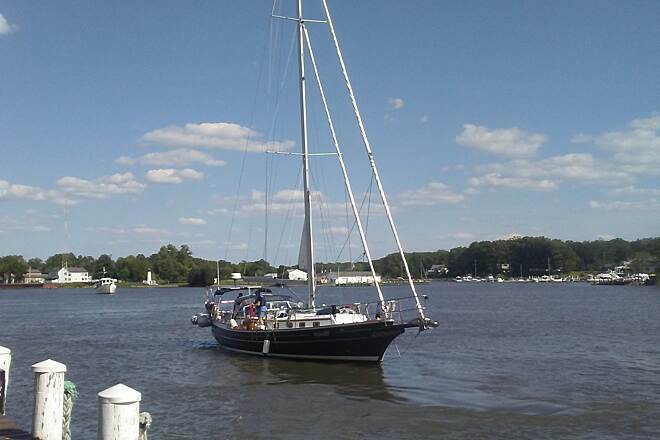 Small craft are a common site on the canal, especially in the warmer months of the year. Taken June 2017. 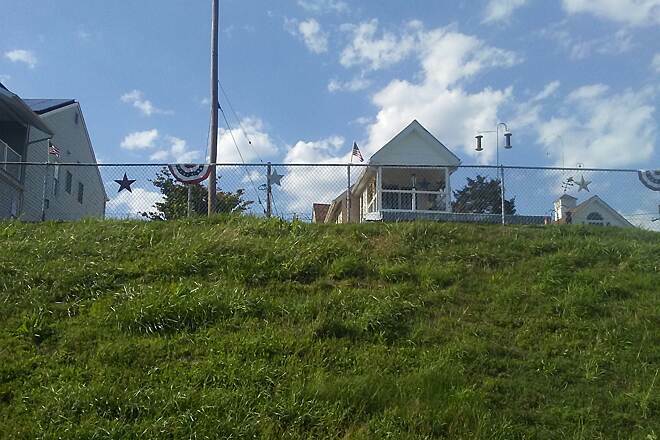 Patriotic symbols decorate this property fence that is visible from the trail in Chesapeake City. 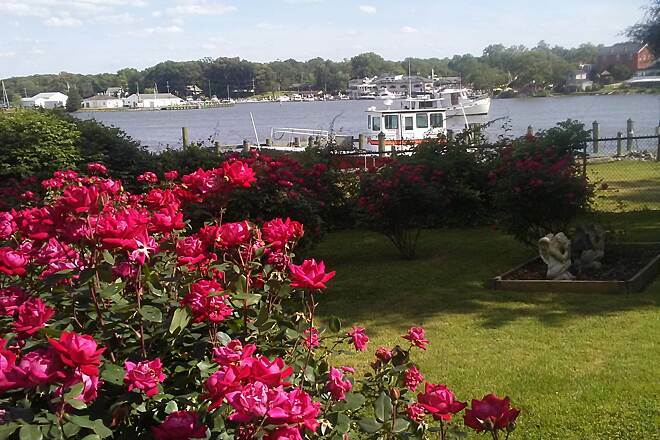 Roses add color to this well-landscaped lawn at the trail's western terminus in Chesapeake City. 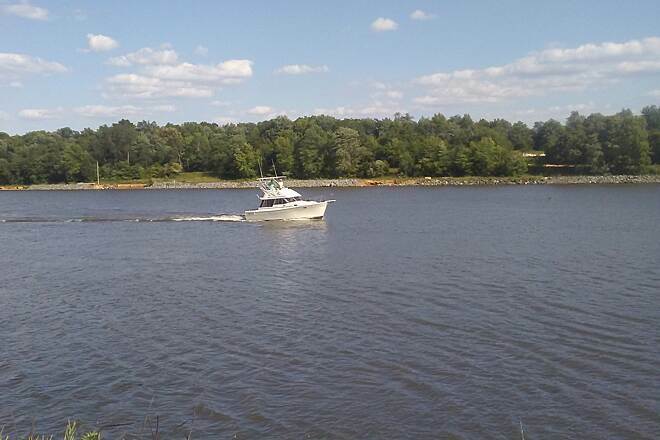 One of many watercraft using the C&D Canal on a sunny, spring day. 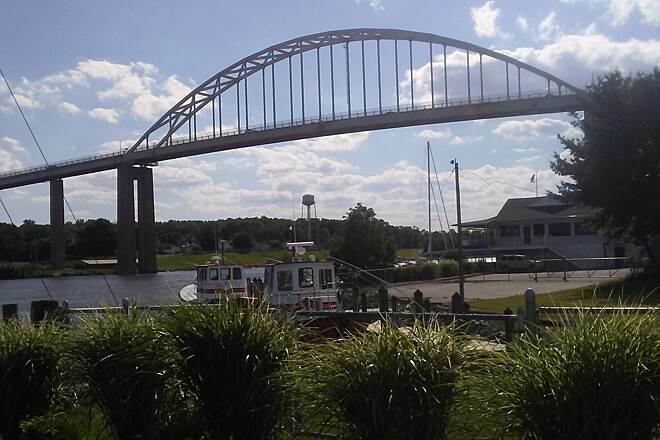 Approaching the western terminus in Chesapeake City, with the Route 213 bridge dominating the background. Taken Sept. 2016. 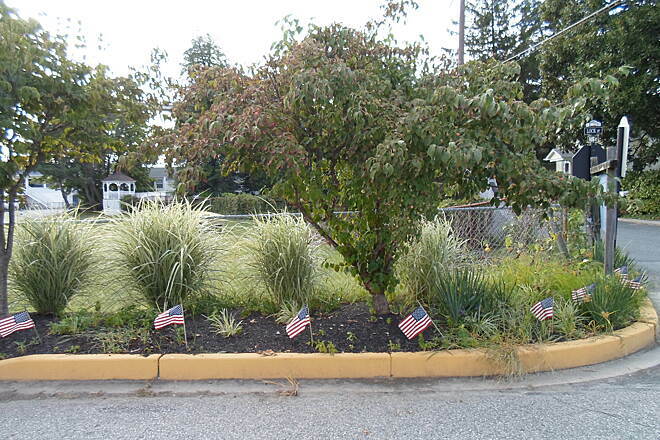 These gardens are located near the trail's western terminus. 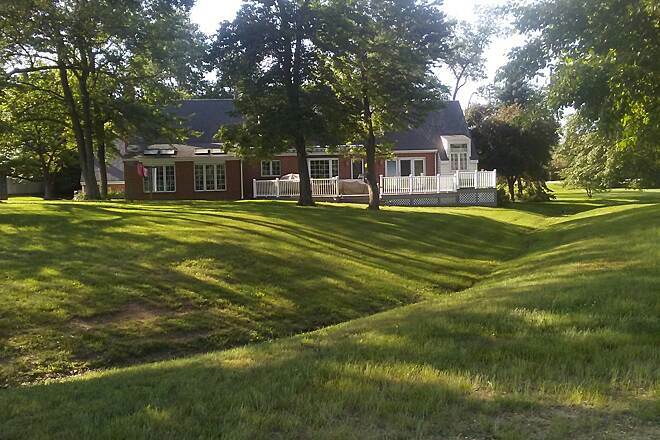 This modern-looking home is located along the trail on Chesapeake City's east end. 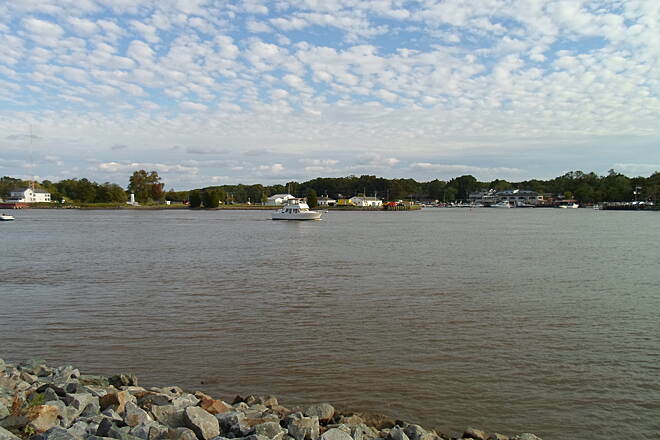 Heading east out of Chesapeake City, toward the DE border. 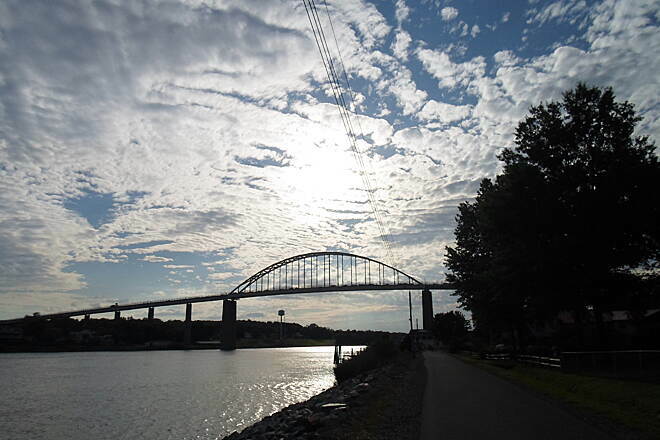 View of the canal, seen against a late summer sky in Chesapeake City. 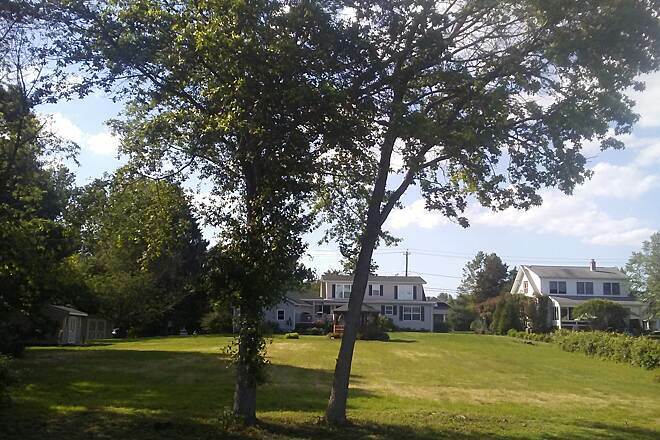 Taken Sept. 2016. 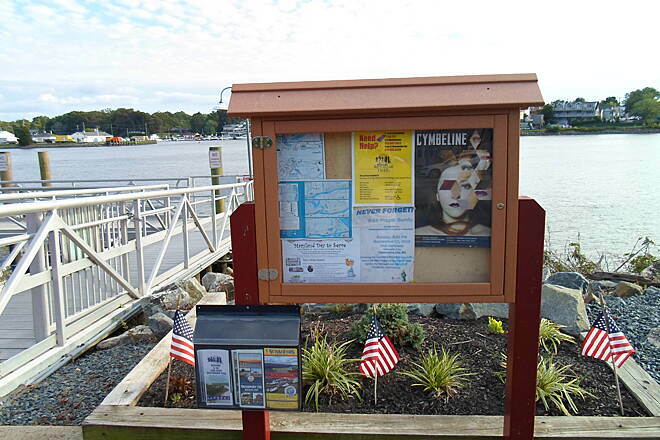 This kiosk is at the western terminus of the trail in Chesapeake City. 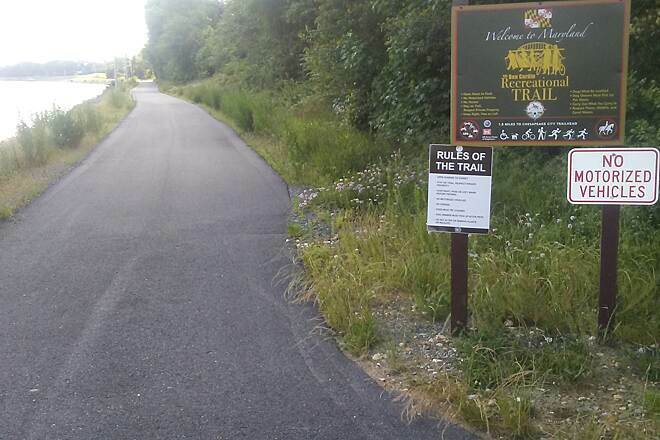 This sign greets trail users at the western terminus in Chesapeake City. 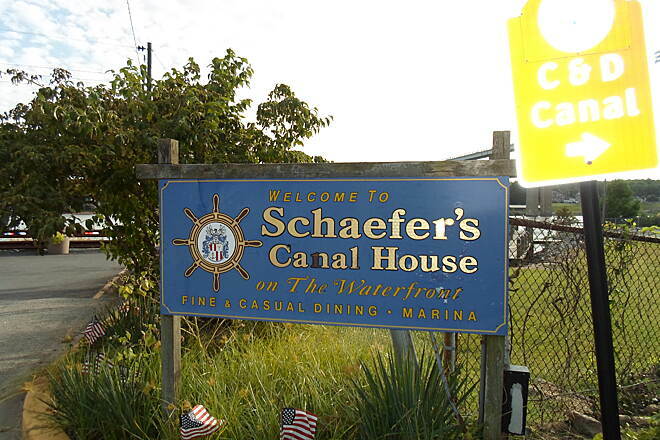 Schaefer's is a great place to relax and have a good meal after spending a day on the trail. 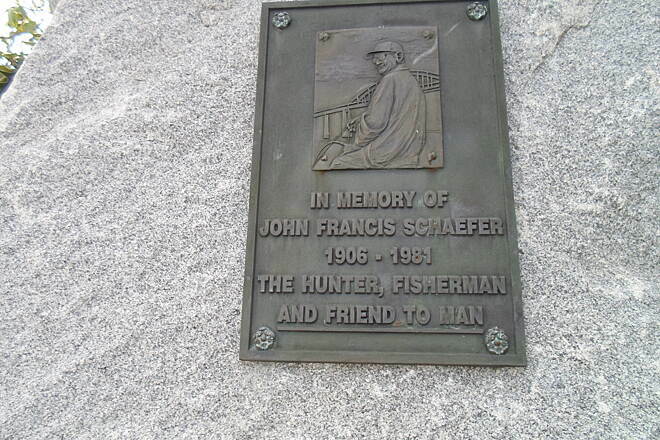 Closeup of a plaque on the memorial at the western terminus of the trail in Chesapeake City. 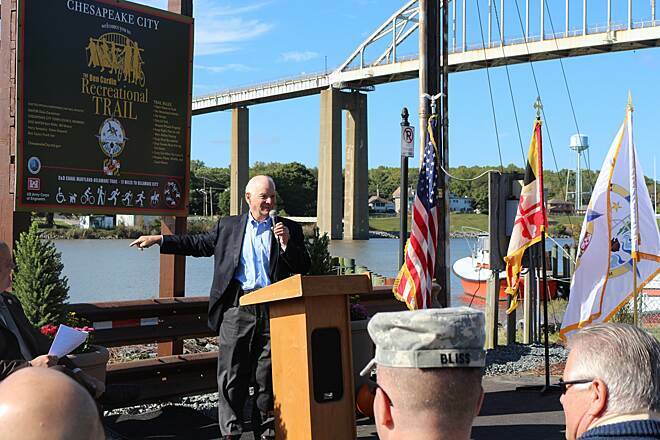 The Ben Cardin trail becomes the Michael N. Castle Trail at the Delaware Border. 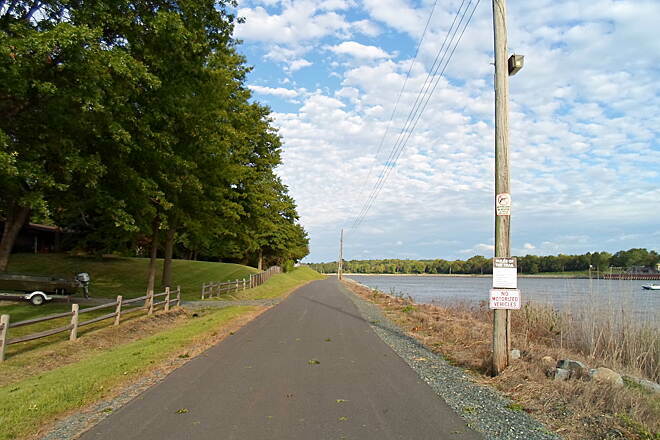 When completed later in 2016 there will be a continuous trail from Chesapeake City, MD to the ferry landing at Delaware City, DE.